Globe photographer Alex Martinez visited the “Sky Dazzlers” gallery exhibition earlier this month in the George S. & Dolores Doré Eccles Art Gallery at South City Campus. The exhibit contains a gallery of works by Navajo artist Gilmore Scott, whose paintings represent how he views his Dine (Navajo) heritage. Using geometric designs associated with woven Dine rugs, Scott’s artwork includes southwest desert landscapes, as well as traditional baskets and homes. The “Sky Dazzlers” exhibit will be on display in the Eccles Gallery from 7 a.m. to 10 p.m. weekdays through Dec. 14. The gallery is free and open to the public. “Woven Female Storm” by Gilmore Scott, part of the “Sky Dazzlers” exhibit at South City Campus. “Turquoise Sky Dazzler” by Navajo artist Gilmore Scott. Scott’s paintings represent his perspective on Dine (Navajo) heritage. A gallery of his work is currently on display at South City Campus. “Blue Sky Dazzler,” left, and “Sun Ray Dazzler” by Gilmore Scott. Scott’s paintings serve as interpretations of how he views his Dine (Navajo) heritage. A gallery of his work is currently on display at South City Campus. “Journey Under the Sun” by Navajo artist Gilmore Scott. 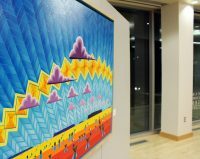 The painting is part of the “Sky Dazzlers” exhibit, now on display in the George S. and Dolores Doré Eccles Art Gallery at South City Campus. “Journey Under the Sun,” right, and “Sun Ray Dazzler” by Navajo artist Gilmore Scott. The paintings are part of the “Sky Dazzlers” exhibit currently on display in the George S. and Dolores Doré Eccles Art Gallery at South City Campus. “Woven From Our Sun, Clouds and Blue Sky,” left, and “Sun Dazzler” by Navajo artist Gilmore Scott. Scott’s artwork is currently on display at the George S. and Dolores Dore Eccles Art Gallery at South City Campus.